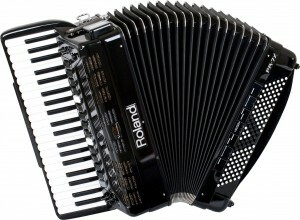 Here at The Accordion Shop we are pleased to be able to offer new and used Roland piano accordions for sale. We are able to supply any model in the range. We also occasionally have preowned examples for sale, please check with us for our current stock level. The V accordion range was first launched in 2004 by the Japanese electronics giant Roland, following several years of intensive research. This innovative range of instruments was the vision of Mr. Ikutaro Kakehashi, the founder of Roland, who wished to create the world’s first fully digital accordion. This ground-breaking project featured Roland’s brand new Physical Behaviour Modelling technology, which brought with it the control and range of tonal dynamics normally only found on an acoustic instrument. Combining the playability of a quality acoustic accordion with all of the practicalities of an electronic instrument, the Roland V accordion was quickly embraced by accordionists worldwide. Today, the V accordion collection boasts a wide range of models, with instruments suitable for players of all levels, from the student to the professional. The current line-up consists of the FR-1X, a lightweight and compact 72 bass 26 key model, which is ideal for the smaller player, or for those who wish to take the instrument travelling with them. 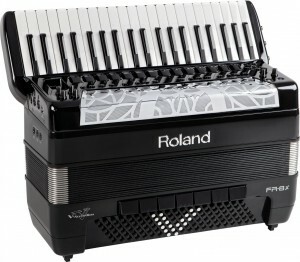 The next size up, the best-selling Roland FR-3X, is a 120 bass 37 key compact accordion that is ideal for most musicians’ needs. This extremely popular model is packed with features including a wide range of orchestral voices, whilst still being lightweight enough for most players. 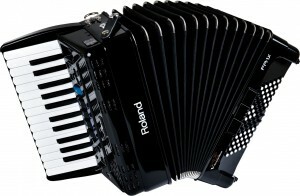 The range-topping FR-8X is a full size 120 bass 41 key accordion. This flagship model is the ultimate digital accordion with every feature you could wish for. 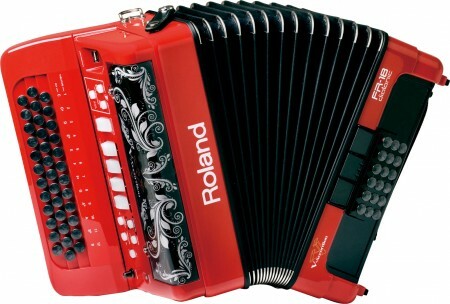 All Roland accordions are constructed in Italy to an excellent standard, using only the best materials. At The Accordion Shop, we can order any model from the Roland V Accordion range, and often have a selection in stock to try. 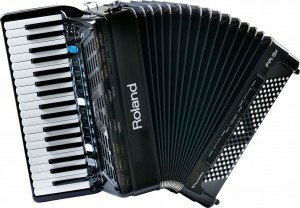 Contact us today for further information about new or used Roland Piano accordions for sale. With the incredible new FR-8x Piano Type, Roland has perfected the synergy between traditional accordion playability and modern digital power. The latest flagship piano-type V-Accordion is jam-packed with features and enhancements developed with input from the world’s top players, bringing a previously unattained level of expression and versatility to every accordionist. Innovative Dynamic Bellows Behavior technology delivers the true bellows response of an acoustic accordion, while the expanded sound set, four powerful multi-effects, an onboard looper, and much more offer a treasure chest of tools for dynamic musical exploration. Seamlessly fusing top-level technology with familiar acoustic tradition, the FR-8x Piano Type V-Accordion ushers in a new era of creative freedom for players everywhere. The V-Accordion is the first instrument of its kind to provide powerful digital modelling technology in a traditional, immediately familiar, accordion design, and with performance functions and authentic sounds. It combines the familiar sounds and nuances of a traditional accordion with the versatility of a modern digital musical instrument. The FR-7x Piano type is the successor to the current FR-7. It is enhanced with the latest V-Accordion features. The perfect combination of the familiar sounds and nuances of a traditional accordion, with all the advantages of a versatile digital instrument. Thanks to the new bellows pressure sensing circuitry, the FR-3x gives faster response, higher sensitivity and precision, plus detection of bellows opening/closing. The USB host allows you to customise orchestra and accordion sounds and to save user program data, as well as MP3/Wavw playback, while the bellows resistance regulator allows you to control the inertia of the bellows. Lightweight and portable, the FR-3x is perfect for students, hobbyists, and stage performers. The FR-1X combines the familiar sounds and nuances of a traditional accordion with the versatility of a modern digital musical instrument. Not only can you simulate up to seven different accordions, but, you can also create your own unique timbres and tuning systems including some amazing organ sounds (using the four organ presets/Harmonic Bar) complete with rotary effect. You can plug directly into an external sound system or recording device, while the headphone socket is ideal for silent play. You can play for up to five hours on a single charge!The FR-1X is simple to use, fun to play and at just 6.5kg is the most lightweight and portable V-Accordion yet. Ask for a demonstration of this fantastic instrument at one of our showrooms in Sunningdale or Rochdale. Introducing the world’s first diatonic digital accordion! With the same level of sound quality and natural, dynamic response as its award-winning V-Accordion predecessors, the new FR-18 diatonic is a dream for accordionists seeking a world-class diatonic instrument that can do it all. The FR-18 diatonic features a brand new sound set that lets you choose instantly from a line-up of 12 virtual diatonic accordions as well as a variety of orchestral instruments, Virtual Tone Wheel organs, percussion, and more!